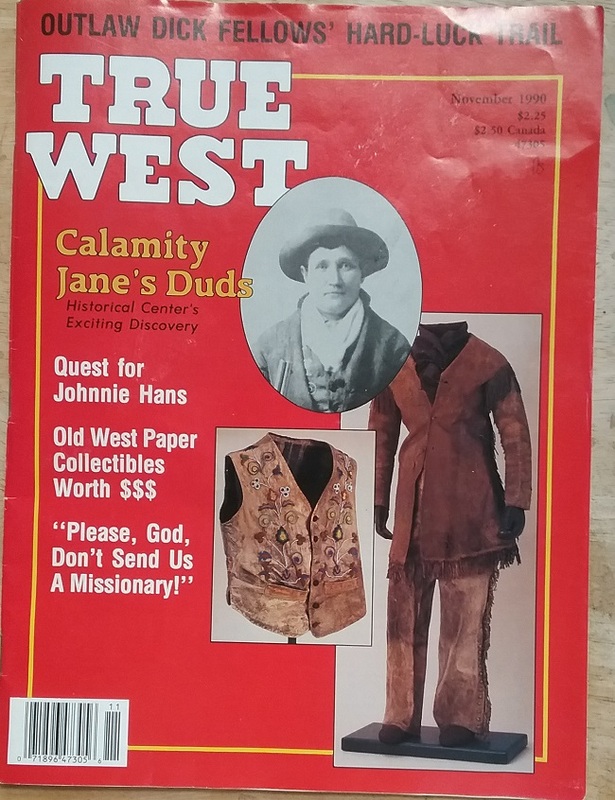 Usually a back issue of True West magazine would not interest me, but this one found at the Goodwill Treasure Center caught my eye with the word “Duds”. And then there was a photo of some interesting looking clothing along with Ms. Calamity herself. Note the publication date of 1990. This was pretty much pre-internet, and so the nature of research was very different than a search of this nature would be today. in 1989 Elizabeth A. Brink, researcher at the Buffalo Bill Historical Center in Cody, Wyoming was given the task of determining whether three garments thought to have belonged to Calamity Jane were, in fact, hers. The items had come to the Cody Center from the collection of artist Frederic Remington. According to an 1897 inventory of Remington’s studio, there were no items belonging to Calamity Jane. 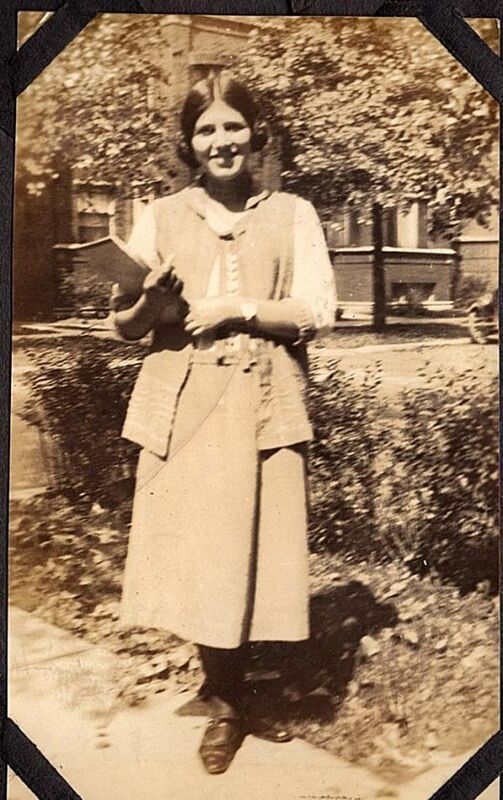 But a 1916 catalog of the contents listed her vest, coat, and trousers. Brink turned to photographs to see if any of the objects at the Cody Center matched up with garments Calamity Jane wore in publicity shots. 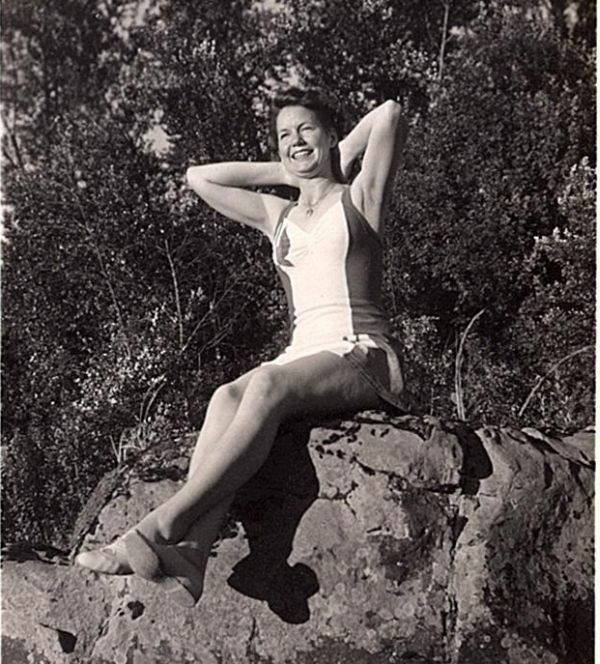 Brink was able to locate around two dozen shots of Jane, most of which are easily accessed today on the internet. In 1989 Brink had to rely on the Center’s library, which fortunately, was up to the task. 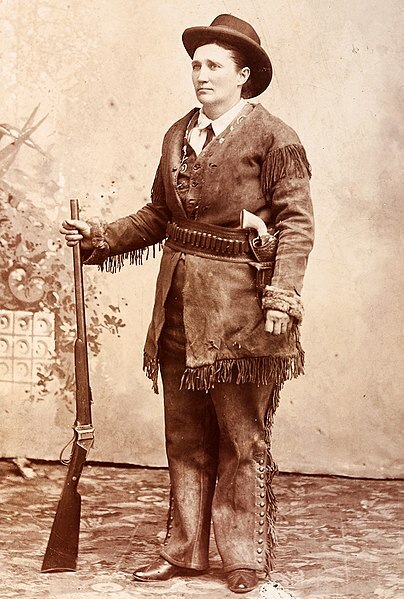 In three of the photos Calamity Jane is wearing the outfit above, a coat, vest, and trousers. That certainly sounded promising. 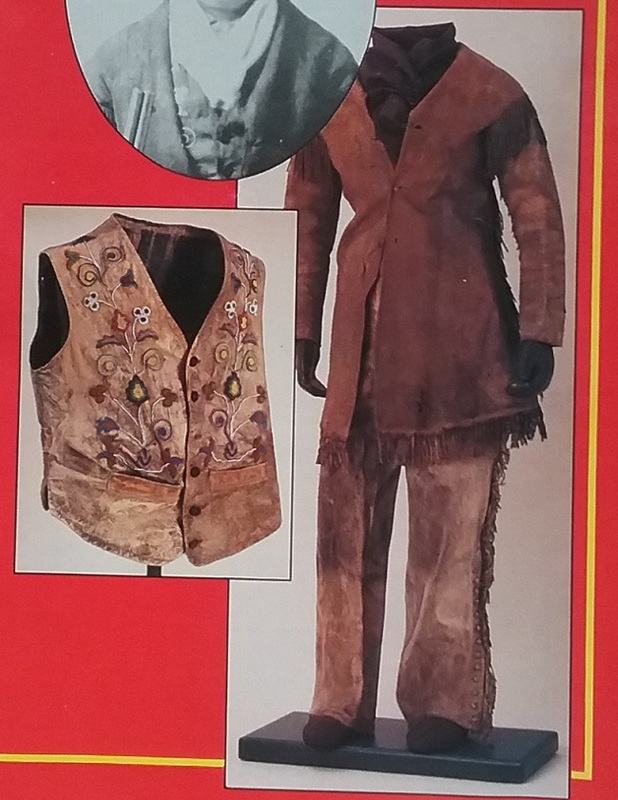 In fact, enough of the decorated vest was showing so that Brink was able to positively identify it as being the vest in the Bill Cody Historical Center’s collection. To add to the evidence, both in the photo and on the garment, the third button down is missing. Brink then turned her attention to the coat. A garment in the collection, a pullover shirt with beaded American flag decorations was labeled as being the coat. But there was no such garment evident in the known Calamity Jane photos. Encouraged by the presence of the vest, Brink decided to closely examine the other garments in the Remington collection. She found a coat that was very similar to the one Calamity Jane wore over the vest in the three photos. In the old photos, there was fur at the cuffs, but no fur was present on the existing coat. However, a close examination of the sleeves revealed needle holes and threads where fur could have one time been attached. She was also able to match up the tear on the lower front seen in the photo with a repair in the garment. The final clue that this was Calamity Jane’s coat was found in the buttonholes, which had a distinctive pattern, with some being vertical, but others being horizontal. The pants were also mislabeled, but another search found a different pair that matched those being worn in the photographs. 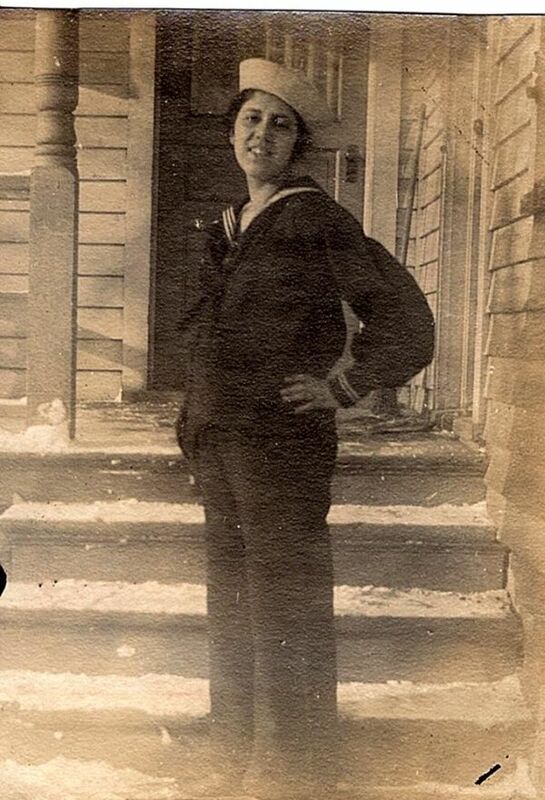 They were identified by the matching brass buttons and a patch on the left leg. I went on a search for an online version of this story, and was unable to locate it. The article by researcher Brink is referred to in much of the literature on Calamity Jane, but I felt that this great story needed a presence on the WWW. Back in the winter I wrote about Hood Rubber. The company made all sorts of products that incorporated rubber, but the most interesting to me were the canvas and rubber leisure shoes. 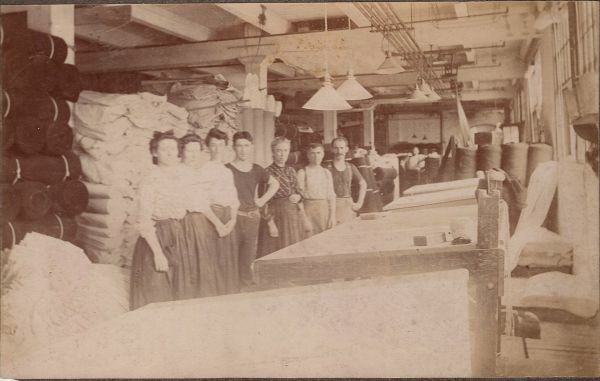 After making the post, my friend Lynn of AmericanAgeFashion wrote to remind me that she had also written about the company because she had a wonderful old photo that showed some workers in one of the Hood factories. When I met Lynn in Charlotte a few weeks ago, she gave the photo to me to add to my archive. The only person identified in the photo is the older woman who is standing between two men. She was identified as Grandmother King. In another pen was added “Hood Rubber Watertown”, and in pencil someone wrote “c 1910”. These identifications were added much later, as the pens used were ballpoints, which did not come into common use until the 1940s. My point is that the circa 1910 seems to be a bit off, as I’d put this at least five years earlier. My guess is this is a cutting room. At the time, athletic shoes were either black or white, and that’s what we can see in the bolts stacked behind the workers. Even though this area has electric lights, the factory still makes use of the natural light by placing the work tables near the windows. And look carefully at the tables. They appear to be spread with the canvas, and you can see the bolts on the floor on the backs of the tables. Old industrial photos of this sort provide a lot of information about everything from the types of clothing workers wore to the way factories were set up. They are hard to find, so I’m really happy to have this one and to add it to my records. Thanks Lynn! This is Helen Ambrose. 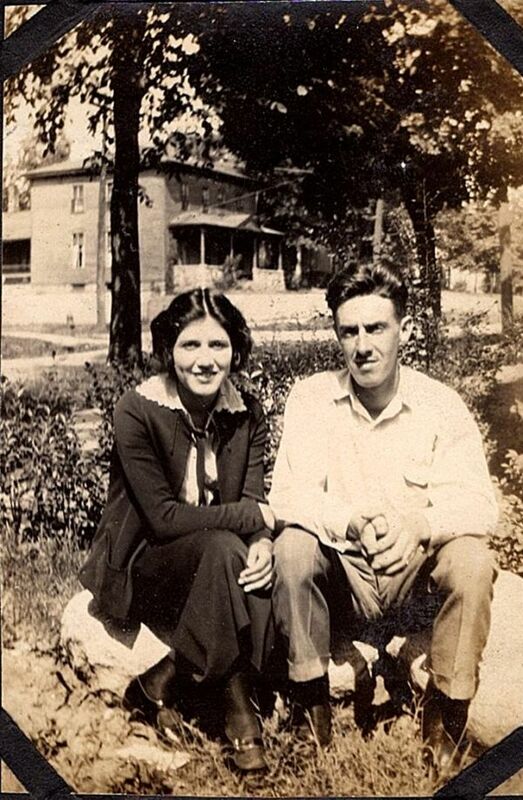 In 1923 her sister, Emily, made a photo album for her with photos of their family and friends. It’s nice knowing the names of many of the people pictured, and also the places, though I came up empty when searching online for Helen. Most of the photos that are labeled were taken in Hinsdale, Illinois or Grand Rapids, Michigan. I bought this album for several reasons, the main one being that it shows Helen in quite a bit of her wardrobe, so that you can get a good sense of her style. We can start with her dark cotton knickers and matching sports shirt. Even better, we get a good look at her canvas shoes and hat. She must have liked this sport ensemble, as she is wearing it in quite a few of the photos, and seemingly at different times. Here she is shown wearing it with a different hat. The object of her attention is Harold Reynders. He is a regular cast member in this year of Helen’s life. This photo was taken on the same day at the same location, a golf club in Villa Park, Illinois. 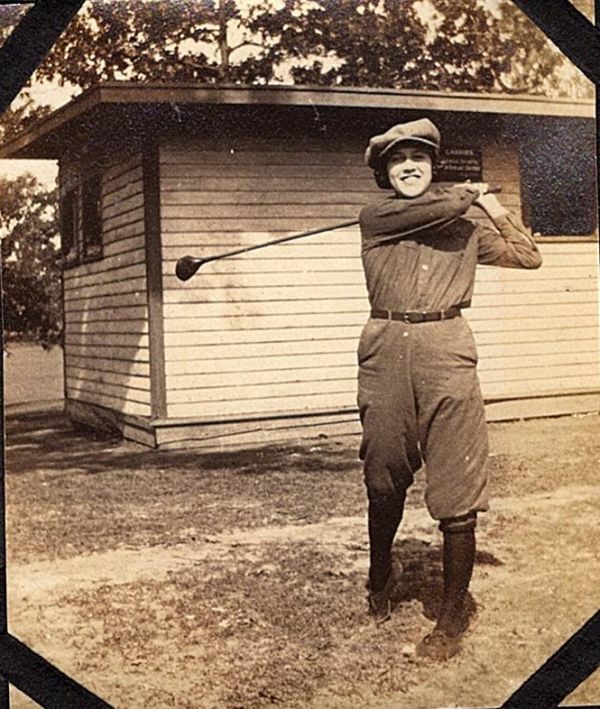 It must have been a very informal place to have allowed a woman to play in pants, or maybe they just mistook her for a boy! There are also photos of Helen wearing her knickers with a middy blouse. Note that she has not yet bobbed her hair, even though she seems comfortable wearing pants in public. In all the photos she is wearing this same hairstyle with the coils at the sides. It gave long hair the look of being short, but it looks a bit old-fashioned for 1923. Many of the photos are of various members of the extended Ambrose family, including these two little unnamed cousins. And here’s the middy with a skirt. 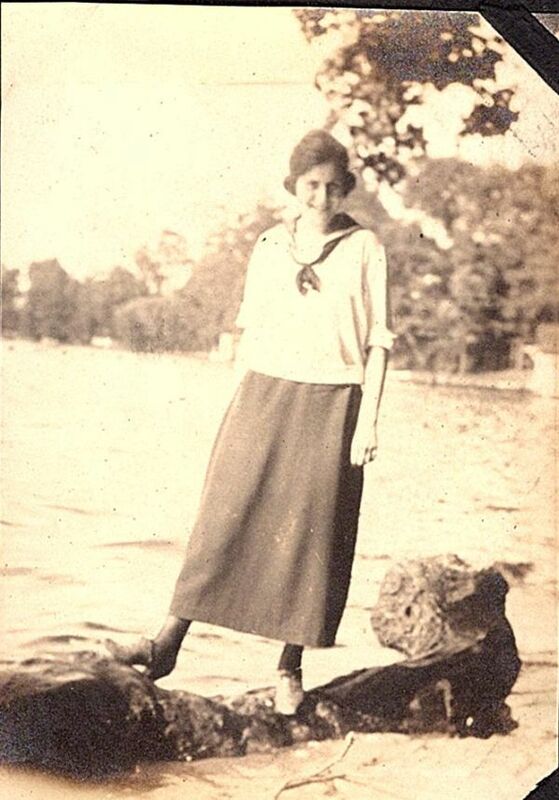 The skirt does seem a little long for a young woman in 1923, but the year before, skirts lengths did take a move toward the floor. 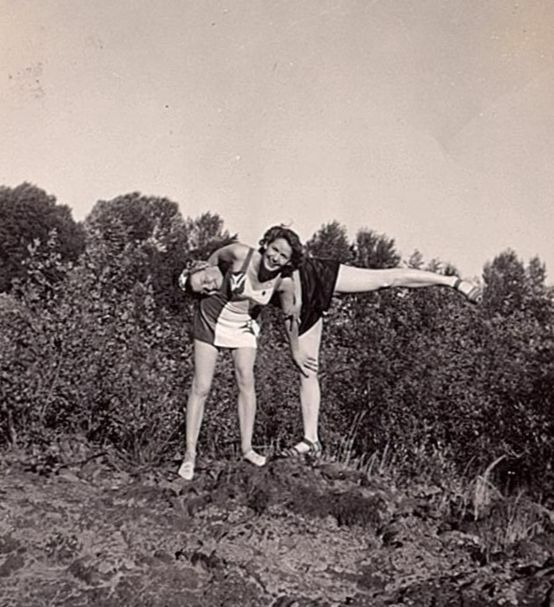 They then began the upward journey to the knee, a length most associated with the 1920s. Helen is wearing a suit that appears to have been made from jersey, possibly cotton. She’s seen wearing it a lot, and with good reason – she looks great in it. I love the scalloped edge of her collar, and the dark tie around her neck. Here she is in another suit, this time with a blouse and vest. And note how the hem on this skirt is just a bit shorter than the others. Could Helen have been a teacher? She looks a bit too polished to be a schoolgirl. 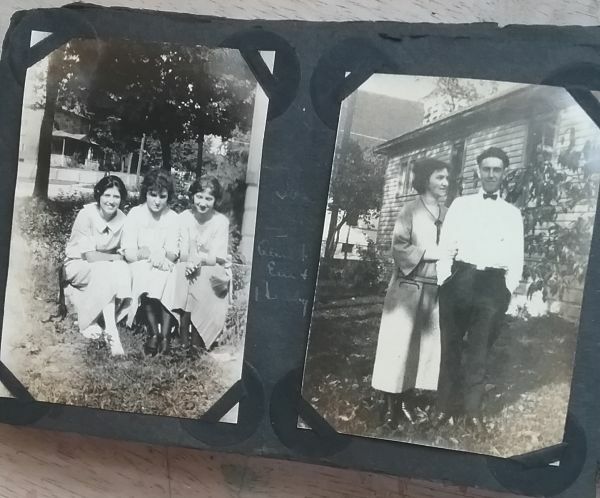 The album is quite fragile, and the white ink Emily used to label the photos is fading badly. That’s Helen, Emily, and a friend, Iva. On the right in the wonderful, but unfortunately unflattering, dress is Aunt Em and a possible uncle. This is Grandmother and Daisy. I’m guessing that Daisy is the child and not the cat, but I could be wrong. 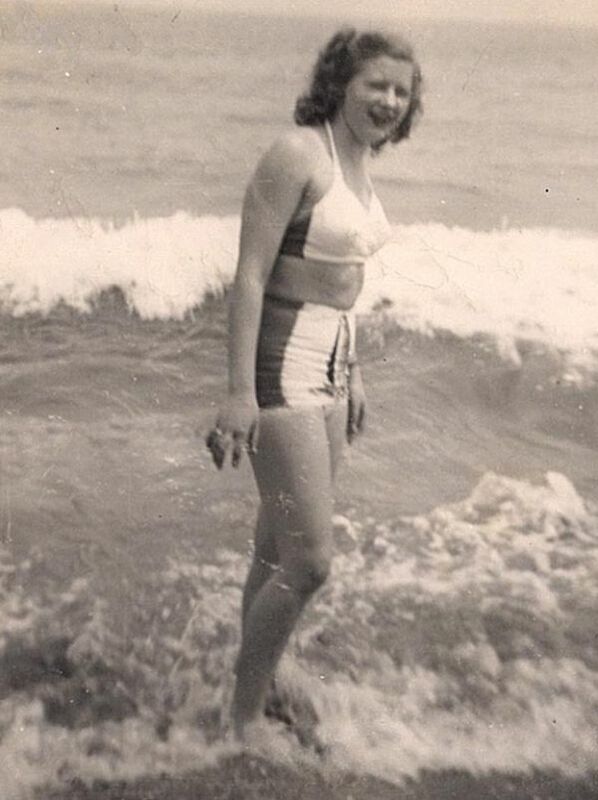 I have a strong suspicion that Grandmother never did shorten her skirts. In this case the entire ensemble was appropriated. Finally, there are some swimming photos, taken at Reed’s Lake, which I think is near Grand Rapids. 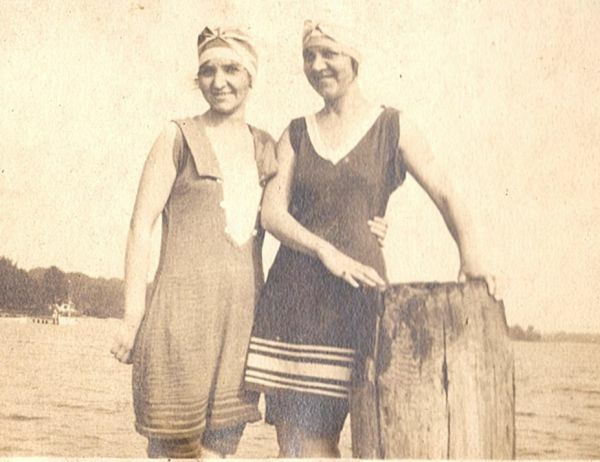 The bathing suits are great, but it’s their caps that I covet. And check out the boathouse. 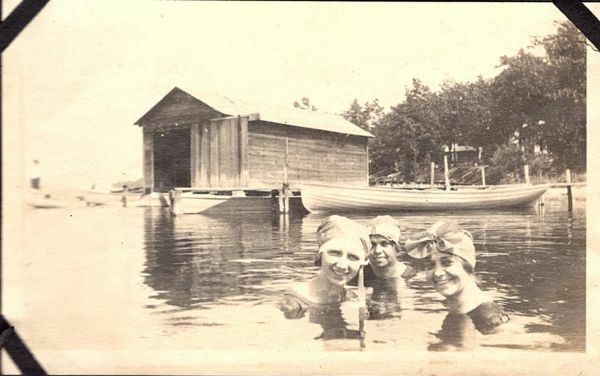 A lake near me has one such boathouse remaining from this era, and it is now a historic landmark. I really don’t want to get into the business of collecting photo albums, but sometimes I come across one that illustrates the times so well that I can’t resist. 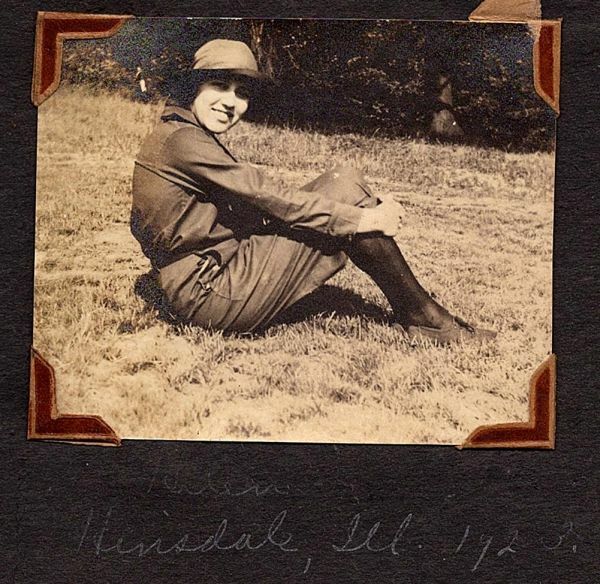 It’s really a shame that this has been separated from family members who would treasure the contents, but we can honor Helen’s life by letting her teach us about her life and fashions in 1923. It still isn’t fallish here in the Southern Appalachians, but how could I resist this fashionable pair? 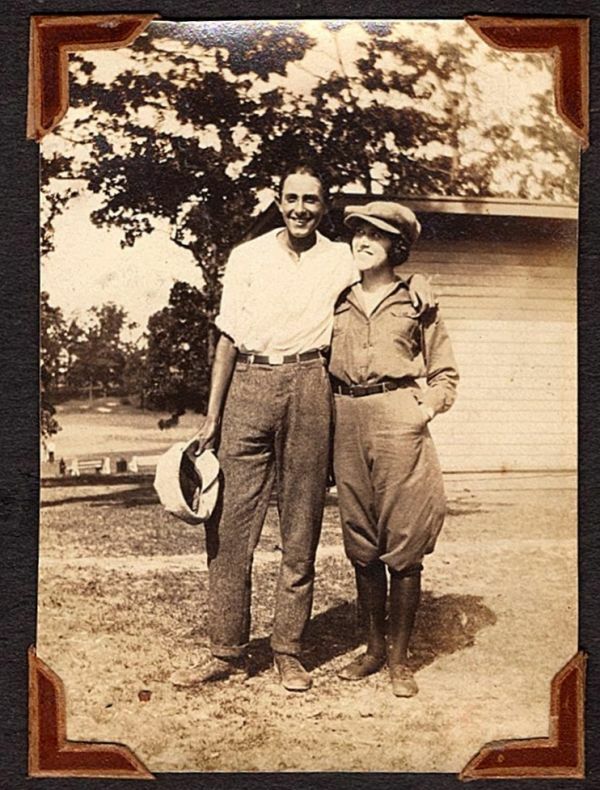 There were many things that led to women wearing pants, and among them is the influence of Oscar and Constance Wilde. Levi Strauss explains the red Tab. The humiliation of trying to resell clothing. The Yves Saint Laurent museum has opened in his former haute couture atelier in Paris. The most interesting man in the world is not in a beer commercial. French designer Hervé Léger, aka Hervé L. Leroux, has died. I’m starting a new feature just to show how I can get something on my mind and just keep thinking about it until I either drive myself crazy, or I find an example. 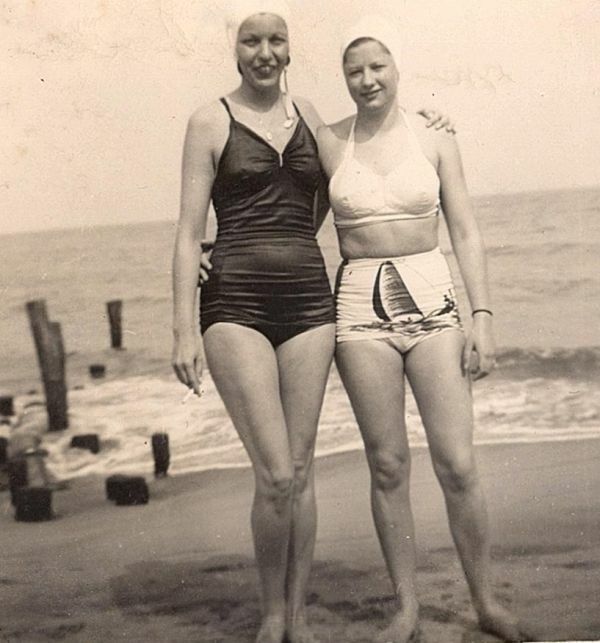 Lately, I’ve been all about swimsuits like the one on the right. These were a wartime innovation, probably in response to the scarcity of dyes and fabrics. All the ads I’ve found date from 1943 through 1949. 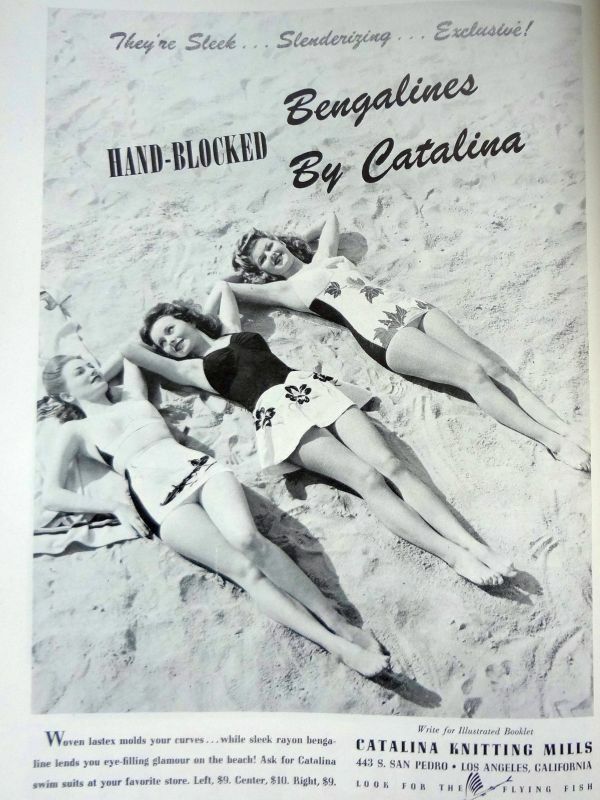 Even though there were two piece swimsuits before WWII, they became more prevalent during the war. Because the pieces of fabric used to construct the tops and bottoms are smaller than would be in a one piece, the cutter of the fabric could be more creative in the placement of the pieces, and could work out ways in which to save fabric. Dyes were made of chemicals used in the war effort, so fabrics were limited to fewer colors. The block printing of the design added color to the white fabric while saving on dye. All of the examples I’ve seen were made by Catalina Knitting Mills of California, and I’ve seen the idea attributed to their designer, Mary Ann DeWeese (Remember these lobster suits by DeWeese?). I imagine there were companies that copied the idea. I’ve seen this outrigger canoe design in shades of blue. It’s pretty impressive! See the difference a few fish (whales?) make? I’m not sure if this one is actually printed, or if it is cut and pieced. 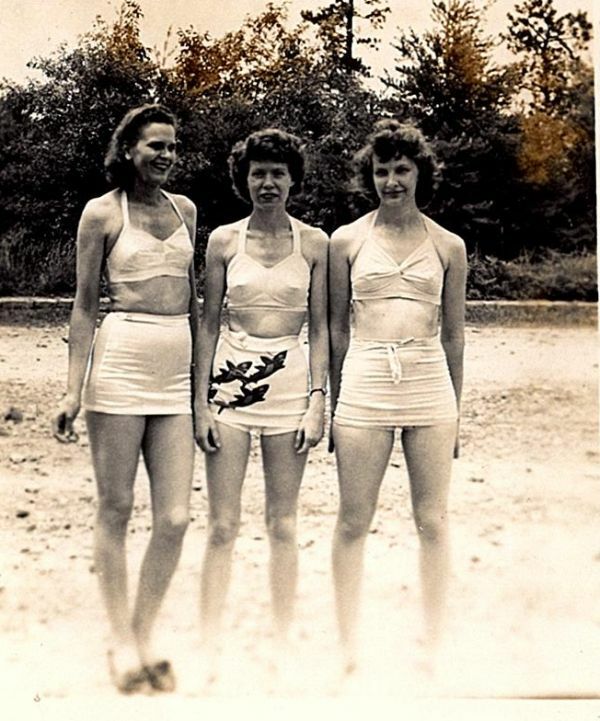 I’m glad I picked this one out to enlarge because the shoes on the woman on the right are very similar to a pair I have. Otherwise I would never have noticed them. And here’s another view of the same suit. These do come on the market quite often, but the prices are always pretty insane. I can see why they are so desirable, so I’ll just wait until I find one in a dusty corner of an estate sale. It could happen, right? 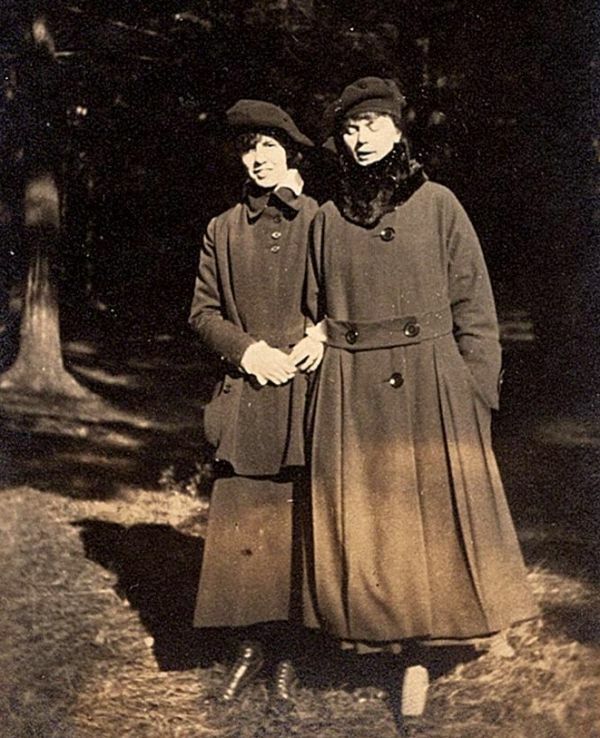 Margaret Graham & Bessie Roher (?) about 1897 or ’98 on the tennis (grass) court at Wood Lawn. 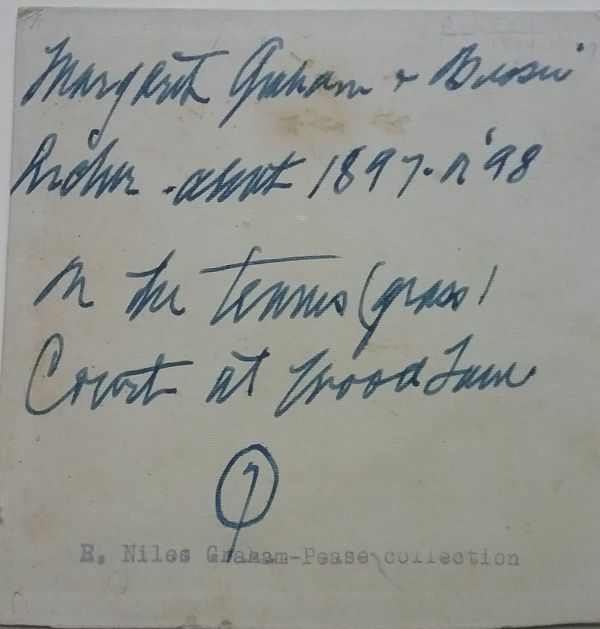 R. Niles Graham – Pease collection. Woodlawn had been the estate of Texas governor Elisha Marshall Pease, the grandfather of Margaret Graham and her brother Niles Graham. Niles was a prominent businessman in Austin, Texas, and after he died his papers along with those of his grandfather were donated to the Texas State Library and Archive. I’m not sure why this photo was not included. How did it end up in the vast market of used stuff? Amelia Earhart is back in the news due to the discovery of a photograph that might be her and Fred Noonan in the company of Japanese sailors. Of more interest to me is this article about her clothing line. I knew about it, but I’m pretty sure the existence of sewing patterns by Earhart is news to me. If my one little tennis photo is not enough, then this link to more vintage photos is for you. 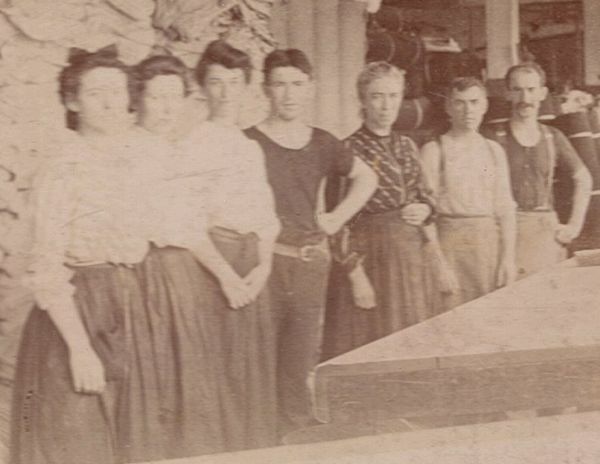 Here’s a very thoughtful article on American production of garments. Is it more ethical to produce in the USA, and if so, why? Look inside a garment factory, and chances are, you’ll see a very diverse group of workers. If you are concerned about your favorite hat factory closing, then do as Georgiette Morgan-Thomas did and buy the company. This has nothing to do with clothing, nor of textiles. But it is of interest to anyone who values history and cultural heritage. I’d like to be able to say I was shocked by this, but unfortunately, I’m beginning to think I’m shock-proof. Please don’t shop at Hobby Lobby. Vestoj published a powerful interview with veteran but recently fired British Vogue fashion edit0r Lucinda Chambers. In it Chambers claimed she hasn’t read Vogue in years, and gave examples of why the magazine lacks relevance in today’s fashion atmosphere. Shortly after the piece was published, it was taken down. It then reappeared saying the piece had been amended after talks with Conde Nast (the publisher of Vogue) and Edward Enninful, the new editor of British Vogue. They objected to the way Chambers described her firing. And so The Guardian asks the obvious question: Does the fashion industry still need Vogue? 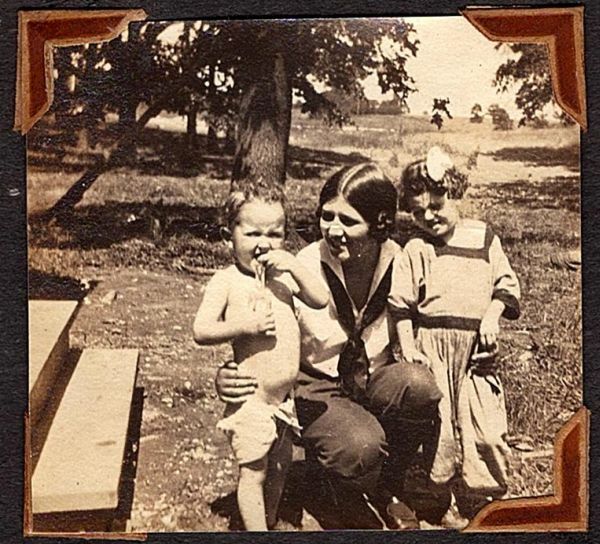 Great tips from Jayne Shrimpton on deciphering clues in old family photos . And finally a story about how documents (and photos?) end up on ebay. Here’s the reverse of the photo. Maybe you can help decipher Bessie’s surname. And if the Texas Archive wants this photo, it’s yours. I took a photo of this photo last fall at the Liberty flea market. It was pretty expensive, but the owner was nice enough to let me take a shot of it. There is so much to look at and think about, and it has given me a chance to use my dating skills to give a shot at when it might have been taken. Unfortunately there was no information about the photo at all, so I have no idea who these young people were. Were they friends? Relatives? Members of a club? The first thing I looked at was the shape of the heads of the tennis racquets. 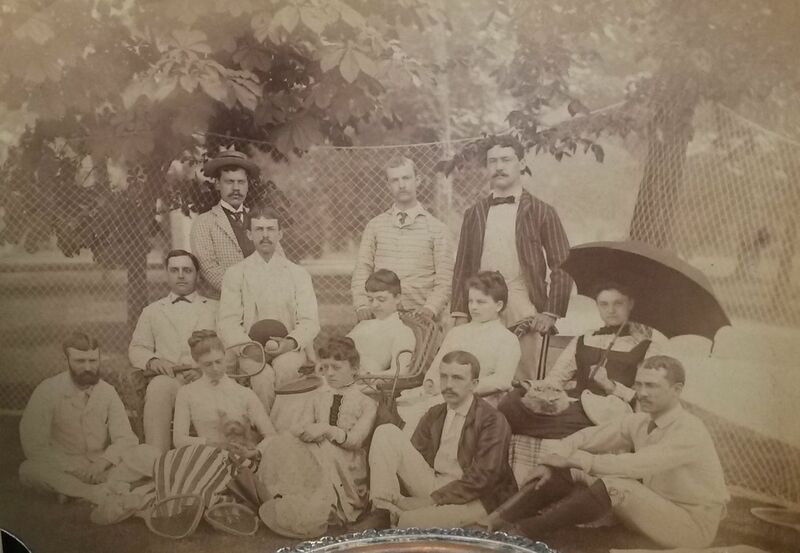 Look carefully at the racquets in the photo and you will notice that they all have a squared off shape at the top of the head. One site I found dated this shape to the late 1880s. Because all the women are seated, and three of them are partly obscured, we might be able to tell more from the men’s attire and hair. I thought it was interesting that seven of the eight have facial hair, with all but one of them having only mustaches. Only the man with the beard has sideburns. Their hair is very short, very controlled, and several have center parts. …very short haircuts, almost shaved up the sides, and clipped necks. A center part was usual, and the hair was oiled. A generous walrus-style mustache appears with some frequency in the photographs. Most of the men are wearing sack jackets, in a style that came out in the late 1880s. The jackets were rounded at the hem to show off the waistcoat, with three or four buttons. The sleeves were shorter than before, allowing a bit of shirt cuff to show. The ties shown are also consistent with the styles of the late 1880s and early 1890s, with both the bowtie, and the black neck tie (tied either over or under the collar) being popular. Pant legs were slim, which you can see on several of the men. As for the women, there are some clues as well. First, I considered what I did not see – the puffed sleeve caps that came into vogue at the beginning of the 1890s. By the middle of the decade the sleeves were the huge leg-o’-mutton that is so associated with the 1890s. Since none of the women are wearing the puffed sleeve, I think it is safe to say the photo had to have been made before 1892. We can see the most detail on the woman on the right. 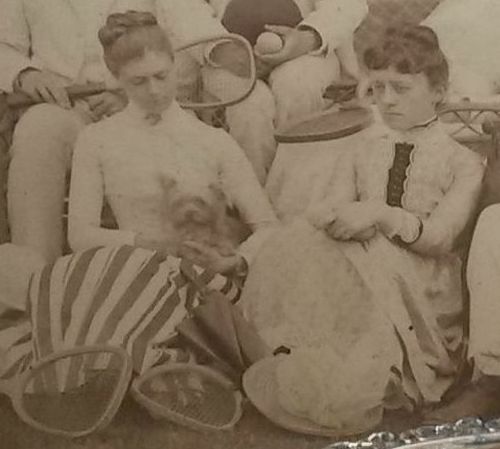 She certainly does not seem to be dressed for tennis, with the lacy underskirt and front of her bodice. The skirt has a draped apron effect, which became more prevalent as the bustle started to collapse around 1886. 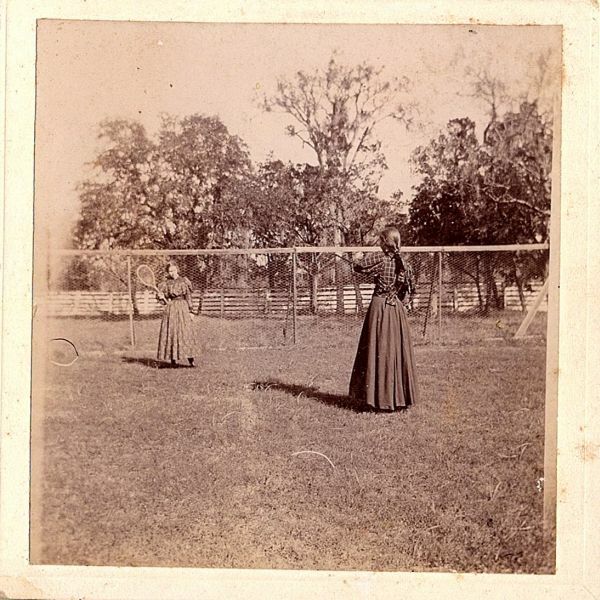 The woman on the left has a much sportier look with her striped skirt. All the women have high collars, another feature of the late 1880s. The sleeves on all are shorter than full length, with the wrist bones being exposed. And then remember that the “bang” is no longer a heavy “mop,” but should be a softly curled fringed that comes like a halo about one’s face, not overshadowing the eyes or hiding the forehead, only shading and softening the entire face. The frizzy bang is essentially bad form. 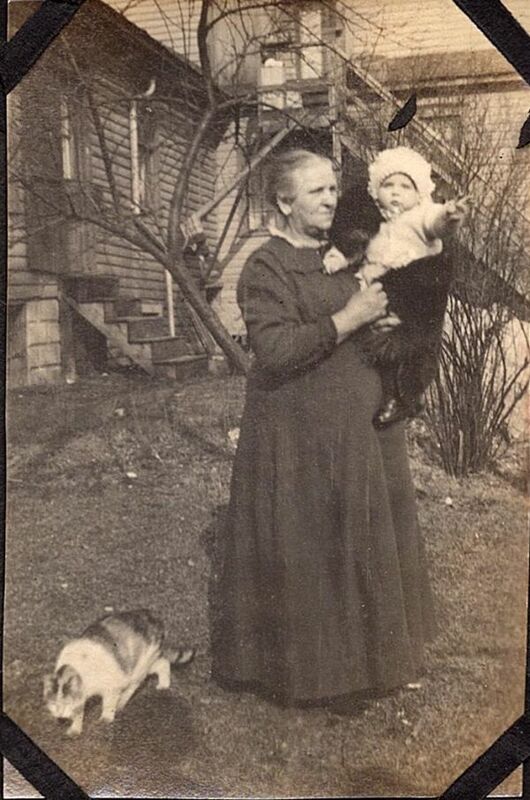 The addition of the little dog in the lap adds a lot of charm to the scene. And do any hat experts care to comment on the hat that is in front of the woman on the right? 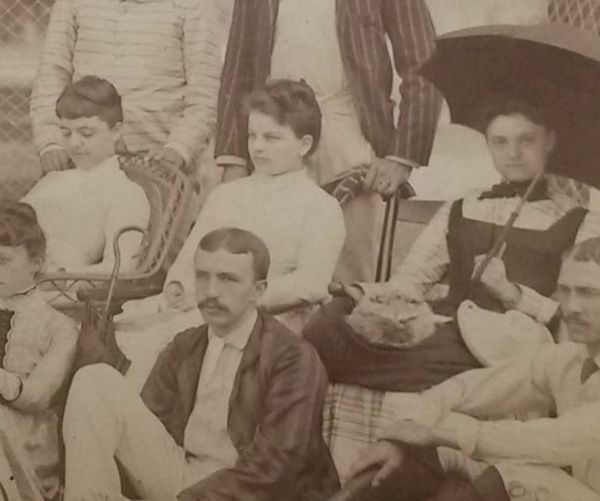 The woman on the right in this section of the photo is wearing a plaid dress with a sort of pinafore over it. I could not find a similar garment in any of my sources, poor as they are. When I posted this photo on Instagram it was asked if that was another dog on her lap. At first I thought it was her hat, but you can see the plain straw hat to the right. Could this be a cat, maybe a dog? So, add it all up and what do we get? My best guess is 1889 or 1890. I don’t mind if you care to point out something I missed, or to correct my dating.